(CNN) – Hungarian Prime Minister Viktor Orban on Wednesday showed no signs of heeding US and European Union warnings to rein in his “illiberal state,” instead introducing new laws that critics say will tighten his grip on power. Hundreds of protesters marched through Budapest and gathered at the parliament building late into Wednesday night, after Orban’s hardline Fidesz party pushed through legislation allowing employers to ask their workers to take on up to 400 hours’ overtime per year. Critics have dubbed it the “slave law.” The government told CNN that the “voluntary changes to working hours” were “in the interest of the workers” and would allow people to work and earn more. Orban’s right-wing party, which holds a parliamentary majority, also pushed through another controversial law Wednesday that will create new courts, overseen by the justice minister, to handle cases concerning “government business,” such as tax and elections, Reuters reported. But with Orban’s justice minister expected to oversee the hiring of judges, rights groups warned the move will set the country further down the path to authoritarianism. Hungary’s parliament was thrown into scenes of turmoil following the vote on the new legislation, with opposition lawmakers sounding air horns and angrily confronting the Prime Minister. Shortly after the vote, around 2,000 people marched through Budapest — some waving EU flags — and converged on the steps of the parliament. Some protesters hurled objects at police, who responded with pepper spray, Reuters reported. Rights groups were also quick to condemn the new laws, warning that judicial independence was under threat. 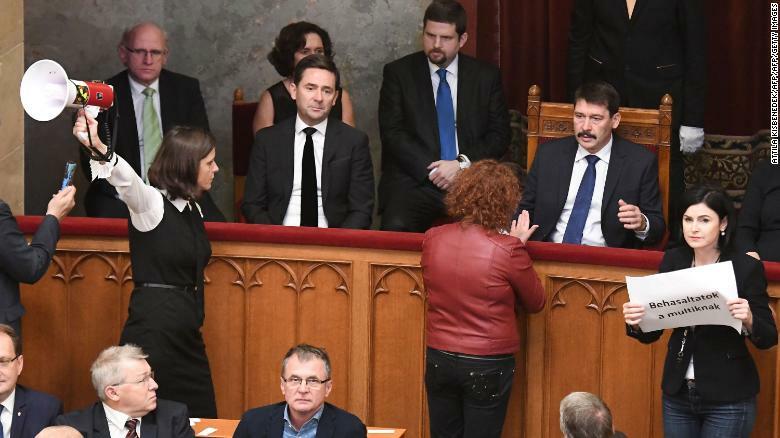 “There is no real argument behind the law, this is simply a political decision that aims to extend the government’s control over the judiciary,” said Dávid Vig, director of Amnesty International Hungary, in a statement. “It is no surprise though, it fits well into the series of measures taken by the Hungarian government to erode rule of law in Hungary,” he added. Why is the EU so concerned about Orban? Since Orban’s populist Fidesz Party swept into power in 2010, and most recently won a landslide victory in April this year, it has come under increasing fire from the European Union over its crackdowns on democratic institutions. Earlier this year, the European Parliament took the unprecedented decision to trigger Article 7 — a disciplinary process — against Hungary over its erosion of democratic norms that spanned everything from the media to migrants. The move came on the heels of Hungary’s “Stop Soros” law — named after the billionaire philanthropist and well-known Orban foe George Soros — which banned nongovernmental organizations from assisting undocumented migrants. Orban’s anti-migrant policies, which have been blasted by the EU, have proved particularly popular in rural Hungary. Orban has also found allies in Poland, which is facing its own disciplinary process from the EU, and with Italy’s similarly hardline interior minister, Matteo Salvini.